Searching for yarn to finish something that will go into the black walnut pot, I came across this linoleum print I made a few years ago. I make linoleum print cards every year for Christmas and it's almost time to get out a block and gouge out this year's image. 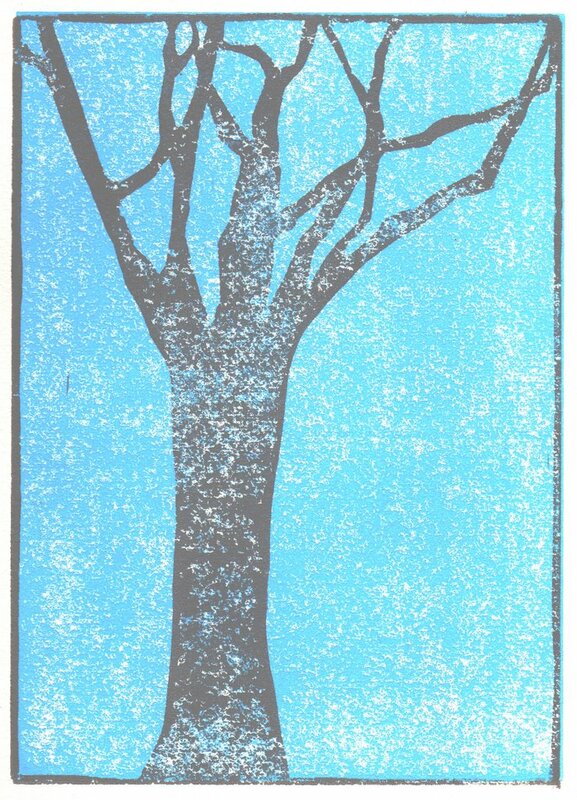 If you've never tried block printing, I recommend Gwen Diehn's Simple Printmaking; it's an introductory book that can take an adult from concept to print and that includes ideas for getting children involved in the process. I use linoleum mounted on particle board blocks, Fabriano paper, Speedball water-based inks, acrylic paints, and sets of inexpensive Japanese gouges--all of which can be found at most art supply shops. Um. Where do you get the ability to draw the image?